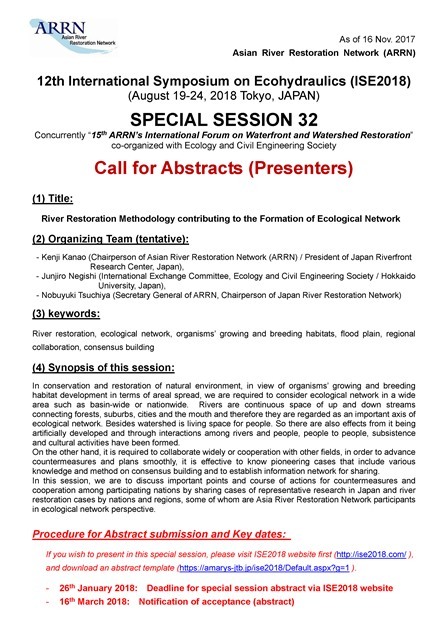 The ARRN annual forum 2018 (15th ARRN’s International Forum on Waterfront and Watershed Restoration) will be concurrently held in Tokyo, Japan in August 2018 as the special session of ISE2018 co-organized with Ecology and Civil Engineering Society. The synopsis of the special session including the procedure for abstract submission and the associated key dates can be downloaded below. If you have any queries, please do not hesitate to contact ARRN secretariat (email: secre@a-rr.net ).